The link is pretty obvious- not a female face in sight. 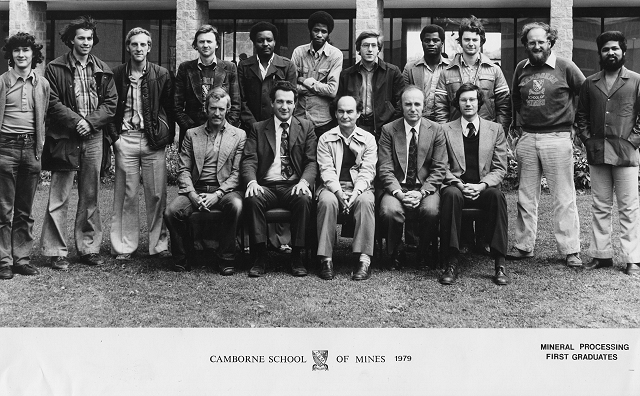 CSM was founded in 1888 and it was not until 1984 that the first woman, Julie Holl, graduated, with a 1st class honours in Mineral Processing Technology. Now Dr. Holl, she cut out a successful career in mineralogy in Australia. In 1985 the 2nd woman, Gaynor Yorath graduated, and I see Gaynor often at Minerals Engineering Conferences, as she has for a number of years been on the staff of the University of Cape Town. Last night was the inaugural event for CSM’s Women in Mining student chapter, and Dr. Kathryn Hadler was the guest speaker. Kathryn is a lecturer in mineral processing at Imperial College, and has a strong track record as a researcher in froth flotation. She is the first woman to hold the post of Editor of the International Journal of Mineral Processing and she gave an illuminating talk “Where are the women in mineral processing”, which she has promised to summarise and will be published on the blog in the very near future. Kathryn is pictured 2nd left below, with Prof. Frances Wall, the first woman Director of CSM (2008-2014) and CSM Student Chapter members Heather Thiel (treasurer), Rachael Gallagher (Vice President) and Kate Gleadow (President), all MSc geologists.